Anyone who knows me, knows I lost 20 lbs last year, well, I gained it all back this year! I know I lost my will power. Anyway, I managed to fluctuate a loss between 3 & 5 lbs, and can’t seem to loose anymore than that! 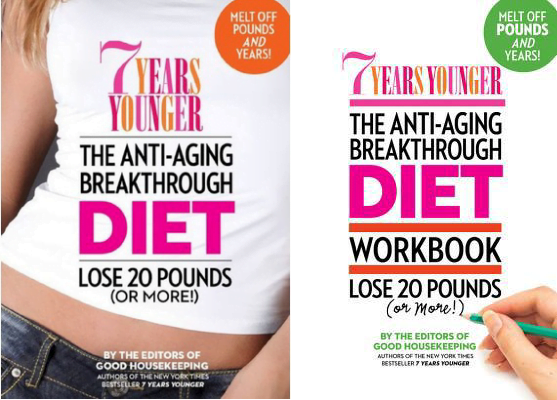 This is why, when I was offered the chance to do this review on the 7 Years Younger: The Anti Aging Diet Book from the Good Housekeeping Institute, I said yes. I received the book just before Thanksgiving, so I didn’t have the chance to follow the diet then, but I am really trying to now. Are you regretting all the holiday calories? Try the 7 Years Younger Diet along with me. Read the book to find out what foods are anti Aging foods to help you shed weight and look younger. Plus, the book tells you what nutrients can defend your complexion against UV rays! Learn about foods that help prevent clots, slow the growth of plague in arteries, lowers triglyceride levels and strengthen blood vessel’s walls? The 7 Years Younger: The Anti Aging Diet Book is not just an ordinary diet book. There is a workbook that comes with the book! Take the initial quiz to find out where you stand before you begin. There are sections to keep track of all of your daily actions and progress, PLUS a menu plan, shopping list, some delicious sounding recipes and tips to help you along the way! A seven-week diet and exercise plan to help both men and women lose weight, improve cholesterol levels, lower blood pressure and strengthen the heart all while nourishing the skin to reverse signs of aging. It doesn’t matter how much weight you need to drop, whether 10 pounds or 110 pounds. It doesn’t matter whether you’re 30, 40, 50, or 60 years old, or whether you’re a woman or a man. This diet contains innovative weight-loss tools that can work for anybody. Use them and you’ll achieve the dream of a thinner, firmer, and more youthful body. This plan is custom- designed to make it happen, step by easy step. Satisfy your craving for unhealthy comfort food with this recipe from 7 Years Younger, anti-aging plan from the editors of Good Housekeeping. Heat 1 teaspoon canola oil in small skillet; add 5 ounces chicken-breast tenders, cut into 7 strips. Cook 5 minutes. Stir in 1 tablespoon cayenne-pepper sauce. 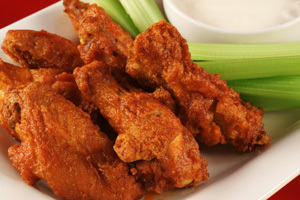 Serve with celery sticks and 1/4 cup low-fat blue-cheese dressing. Be sure to follow & Years Younger on Facebook, Twitter and Pinterest to stay up to date on everything about this incredible plan. If you would like to try this diet for yourself and look 7 years younger (and many pounds lighter) for 2014 purchase the book HERE and begin the weight-loss program and transformation. Come back and post pictures and tag your journey with hashtag #7YearsYounger2014.